The ability to grow plants in a garden is limited by factors that include the weather. Many areas have a change in season with freezing winters when nothing can grow. The best option for having flowers, herbs, and vegetables throughout the year is to have a greenhouse. If you want to use this type of structure, then there are many factors to consider. There are many different types of greenhouse designs that can be used on a property. You can build the structure as a complete DIY project or construct it from a kit. The option you choose usually depends on the time and money needed to complete the project. A greenhouse can be something that you can use on your deck or in a back yard based on the space you have available. 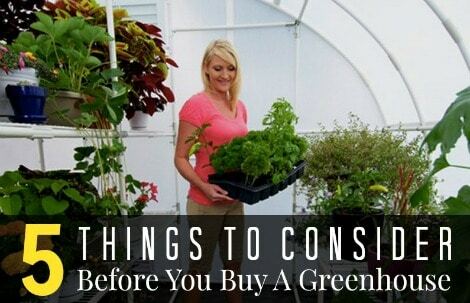 Many people who have a small farm or are just getting started homesteading may find the use of a greenhouse is a great idea. The only thing that may be a problem is determining the design to use. This structure is an ideal way to grow a large quantity of food if it is big enough. However, a smaller scale might be a better option for people just starting out. The materials that are needed to build a greenhouse can typically be found at most home improvement stores. However, the internet may be a better option, especially for the glass or plastic film. One important factor to keep in mind when you are considering adding a greenhouse is any zoning restrictions that may apply. A building permit may be needed if the building is a certain size. You may find that the use of a smaller structure will be a better option.